In this post I'll compare the Zomei 680nm, 760nm, and 850nm infrared filters to see how they differ for black and white IR photography. 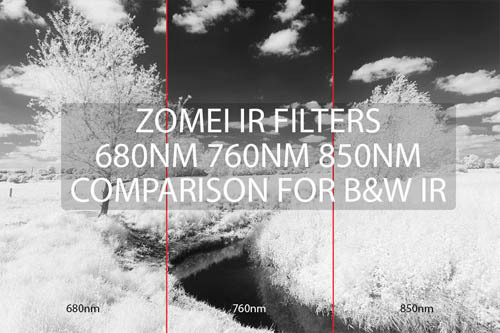 (You can see my previous colour comparison of these filters against other IR filters here: Zomei IR filters review & comparison). In theory you would think that the longer the wavelength that transmission starts from, the stronger the 'IR effect' should be. That is, foliage should appear brighter, and the sky should appear darker the longer the wavelength. Read on to find out if this holds true in practice. Here are the images taken with the different filters. They have all been run through CornerFix to remove vignetting / IR hotspot, then desaturated and had the same curves adjustment applied. Please note the images are taken with a full spectrum converted camera. Looking at the bare sky in the centre of the image, the 760nm and 850nm images are virtually the same in terms of tone. As I said earlier, the deeper you get into infrared (longer the wavelength), the darker you'd expect the sky to be. But as you can see here, it seems that once the majority of visible light has been eliminated (760nm filter), then additionally eliminating shorter wavelength IR (850nm filter) has no effect. With these findings, I can't really see any point to the 850nm filter. It can only give a single toned image but requires a longer exposure than the 760nm and 680nm filters (since it is letting through less light). 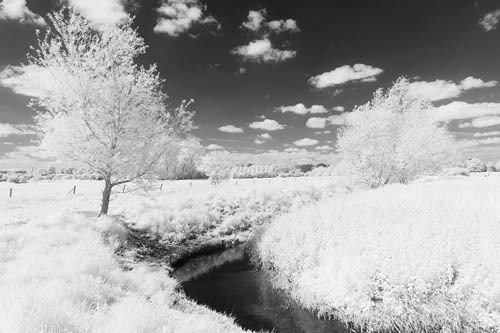 The 760nm and 680nm filters can give the same Black and White results as the 850nm filter, but because they pass some visible light they can be used for false colour IR photography as well. I am going to have my Pentax K7 converted into infrared camera. I am mostly into monochrome infrared photography with minimal post processing. I have a choice between 695nm filter or 830nm filter installed. What would you recommend? Will 830 filter give me better BW out of the camera pictures compared to 695 filter? Or is the difference so little that it is better to have a choice of colour IR? It wouldn’t be used much I suppose but maybe could increase resell value in future. 830nm filter will give you a slightly darker sky than the 695nm filter, but at the cost of longer exposure times. Looking at my test images, the 850nm filter needed around 2.5 stops more exposure than the 680nm filter. The difference won’t be as big between a 695nm and 830nm filter, but I expect the 830nm filter would require about 2 stops more exposure than the 695nm filter. So it depends on what’s more important for you – getting the best images straight out of camera, or keeping the shutter speed as fast as possible. For me, I prefer shooting handheld, f/8 and at low ISO, so I’d go for the 695nm filter. Since I shoot RAW, it would be easy to apply a slightly stronger tone curve to all the images when processing them, to give an image very similar to what the 830nm filter would give. Nice article, very useful ! I have a 1000nm filter, don’t know if it has a stronger effect than your 800nm or 700nm. Do you know if your 850nm is better to see details on far away landscape than your 760nm ? Apologies for the very delayed reply. I haven’t noticed any difference in the haze-cutting ability between 850nm and 760nm. I guess that in theory 850nm would be better. I’m generally a wide-angle photographer, possibly a difference would be more visible at longer focal lengths. I’m relatively new to photography. I’m looking to buy one of these filters as a gift for someone shooting with a 35mm SLR with infrared film. Do you think I can expect similar photo results in film? I know digital is much easier to get perfect results from, but do you have any advice? Apologies for the very delayed reply. If they’re shooting monochromatic IR film, then I imagine the filters should work pretty much the same as they do on digital. 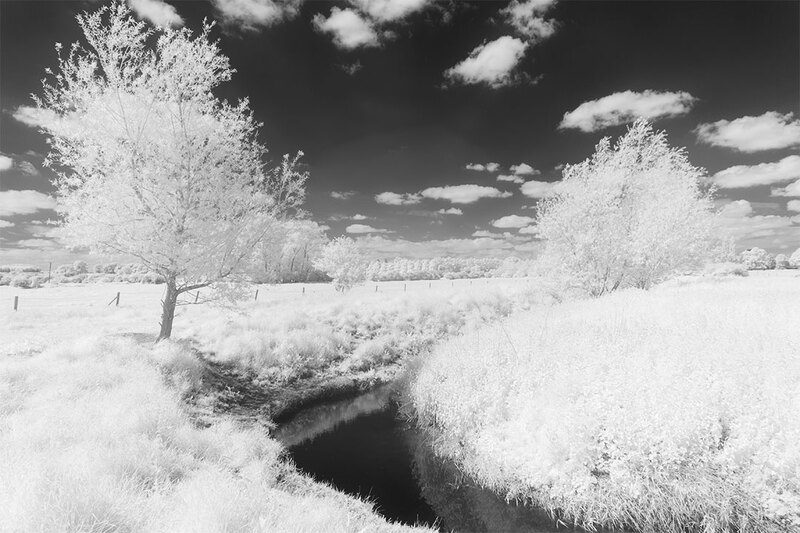 There will be some differences in the actual images due to the nature of IR film compared to a digital sensor, but not related to the filter. (I would think – I don’t have any experience shooting IR film, so can’t be 100% certain). One thing to make sure is that the filter is ‘weak’ enough for the film they are using. If they are using a film that’s only sensitive up to 800 nm, then an 850 nm filter wouldn’t be much use since it wouldn’t let through any light the film was sensitive to.